I don’t know about you but now that the Halloween decorations have come down I started feeling the cottage was looking a little bare so I thought I’d start adding a few festive decorations, especially as I am in full on Christmas crafting mode … it helps to get the festive creative juices flowing … any excuse ! So …. this year I’ve decided to forget about people moaning “it’s too early for decorations” and start putting mine up now so I can enjoy them. Before you start freaking out I don’t mean ‘ALL’ of them, just some. 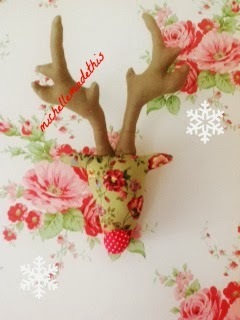 I’m starting with this little fella … Rudolph the spotty nose reindeer. 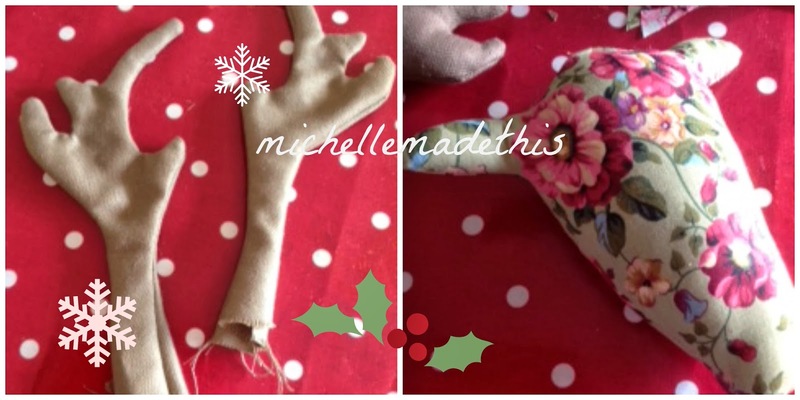 I’ve been seeing a lot of lovely stag heads online and in magazines and have even started a pinterest board for my love of reindeer! I’ve had this little guy planned in my head for a while and finally got round to making him this week. Orders to make and products to post in my etsy shop so I better go go go ! What a great project, Michelle! You have just described my daughters Christmas to a 'T'. And she loves it too! So good idea to enjoy a snippet or two now. I love your reindeer head. They are my favourite decorating idea at the moment and I am tempted to make my own. Not sure it or he will look as good as your though.